Affordable Shutters supply and install shutters and blinds to fit all types of windows. What makes us different is the quality of the products for the price you pay. Please call to arrange a consultant to come to your home for an obligation free measure and quote. 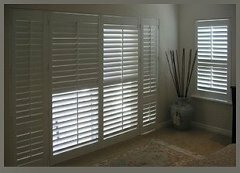 We offer a full installation service of your shutters and blinds. All work is carried out by qualified carpenter joiners. Shutters are a sophisticated and versatile addition to any home or business. Shutters offer a stylish alternative to other window dressings, and with their different styles are able to offer the options of full height, teir on tier or cafe. 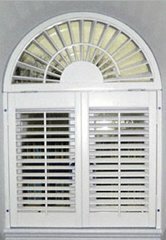 Shutters can fit either inside or outside the window recess. 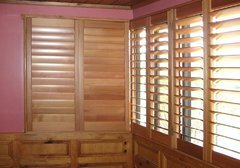 Basswood shutters can be stained or painted to add a modern or classic look to your home. They are available in 64mm, 89mm and 115mm blade widths. Aluminium shutters are a versitile shutter, being suitable for both interior and exterior applications. Available in hinged, sliding or bi-folding styles, aluminium shutters are lockable and come with a 10year limited warranty. 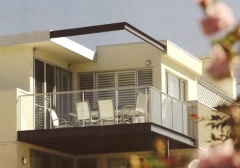 Aluminium shutters are available in a range of powder-coated colours.